Design, Analysis and Implementation of Algorithms for Problems arising in Computational Geometry, Graph Theory, Discrete Mathematics, and Data Science. 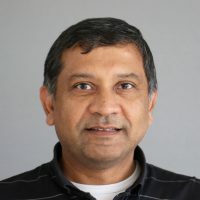 Dr. Maheshwari works in the field of design, analysis, and implementation of sequential, parallel, and external memory algorithms for problems arising in Computational Geometry, Graph Theory, and Data Science. Recently, he has been looking into problems related to geometric graphs, geometric location analysis and shortest path problems. His research work in geometric graphs is centred around the theme of establishing graph theoretic and geometric properties of the underlying spatial configuration, and use them to design efficient algorithmic solutions. The graph theoretic properties of interests are connectivity, bi-connectivity, spanning properties, diameter, planarity, perfect and bottleneck matchings, Hamiltonian cycle, separators, independent sets, vertex and edge colourings. The geometric graphs of particular interest are spanners, unit-disk graphs, plane graphs, proximity graphs, Delaunay triangulations and its variants. In geometric location analysis, he studies various algorithm design questions related to finding the best location to place facilities. In geometric path problems, he looks at variants and applications of shortest path problems in two and three-dimensions. The above three areas are interrelated. Often a geometric problem is transformed into a graph problem, and by exploiting the geometric structure a faster algorithm for the graph problem is obtained. Geometric spanners are main ingredients used in designing efficient algorithms for geometric path problems. This, in turn, requires the construction of spanners having useful structural properties. Matching in geometric graphs helps in understanding and discovering combinatorial and geometric structures inherent in these graphs. In location analysis problems, the underlying geometric structure with graph-theoretic techniques is exploited to design faster algorithms. Dr. Maheshwari received his bachelor’s and master’s from Birla Institute of Technology and Sciences and his Ph.D. from Tata Institute of Fundamental Research in India. He was a postdoctoral fellow at the Max-Planck Institute for Computer Science in Saarbrücken, Germany from 1993-94 and Research Associate at Carleton from 1994-95. He joined the School of Computer Science as an Assistant Professor in 1996 and has been a professor with the school since 2007.